Couldnt ask for anything more. Cove Gardens was the perfect property. The views are spectacular, the house is plenty roomy, and the location is great! Really enjoyed being able to drop our kayaks and paddle boards in and just go without the hassle of leaving the property. We had an amazing week and look forward to another hopefully at Cove Garden next year. Website was easy to use. It was easy to get in touch with someone and to have our questions answered quickly and prices were reasonable. Our family had a great experience at the Beach Road Charmer. The house was so roomy and comfortable, a great place for our family to gather. This was important as we did have a few rainy days. Also our small dog loved the large deck! The location was great, being so close to the beach and just a few minutes from the downtown Orleans area. Would definitely rent the property again! Quick, efficient, courteous communications and responses to queries. No extra baggage in the way of advertisements, come-ons, etc. Got the job done. Surprisingly wide vista combined with surprising amount of privacy in what is a pretty densely populated neighborhood. Old-Cape-style accommodations and grounds (but with internet & TV). We had a wonderful time. Beautiful home, very nice owners. Beautiful views, very peaceful. The many books, crafts and movies really invited us to enjoy ourselves. It was comfortable, charming and we are lucky to have been here. This is the best decorated and well stocked home we've been in. You thought of everything and your generous spirit helped make our vacation extra special. Team was terrific. We felt bad when we locked ourselves out. We were visiting on the deck and someone closed the door without checking to see if we had the key or that the door was unlocked. We called and went out to dinner, and before we were served we got a text message saying the key was back in the lock box. Many thanks!! The property is lovely and well maintained. The room furnishings are extremely comfortable. 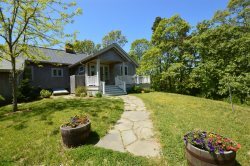 It is private and clean and the access to Nauset Beach is perfect. Very responsive and effective communication as well as assistance. Perfect price and perfect week. Excellent communication. Quick response times. You really have gone above and beyond to make sure your guests really feel this is 'a home away from home. Very good! Always professional and helpful. Your team is great. Great communication. Very prompt as well. You guys were great! Thanks for bringing us the beach cart.